Exploring the education systems of other countries develops an understanding of how education systems work and the differences and commonalities in their aims and purposes. Overseas alternative education setting placements are also encouraged as a way of deepening experience and understanding. Dr Jane Courtney is working for World Education, an International NGO that was recently funded for a Food For Education (FFE) project, a three-year program supported by the U.S. Department of Agriculture. 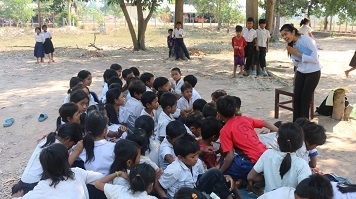 The purpose of the programme is to improve food security, expand access to primary education, promote early childhood development and enhance learning outcomes in Cambodia. Jane is providing the strategic leadership and training to support a group of teacher educators from Cambodia to deliver training to over 3,000 teachers and librarians on early Khmer literacy and child development, equipping classrooms with thousands of learning and teaching materials, and building the capacity of government teacher education providers, school leaders and officials to strengthen and support teachers’ ongoing professional development at all stages system-wide. The educational component has been designed by Jane as a pilot model for validating and standardising Continued Professional Development for the Ministry of Education Youth and Sport, who are interested in developing the teaching profession to Bachelors level. Jane has worked closely with the Ministry and their teacher career development committee to trial this programme. Teachers in rural areas lack classroom expertise and resources. 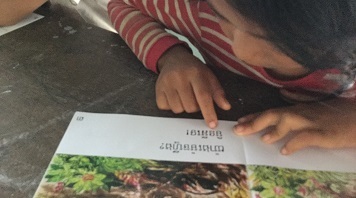 Training in new teaching techniques, and the provision of children’s story books, resources and mats for schools is already beginning to impact on classroom practice. Recent developments in technology has allowed Jane to develop high quality videos with the project team and schools so that teachers can see the new techniques and materials in practice in training sessions. This gives teachers the confidence to try out the resources in their schools after training. 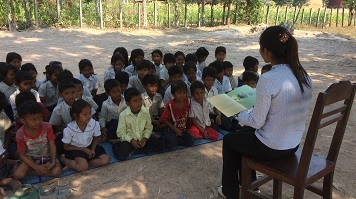 The training group have been introduced to social media and they are regularly uploading photos of training sessions and teachers in action which encourages everyone in the implementation of the programme.